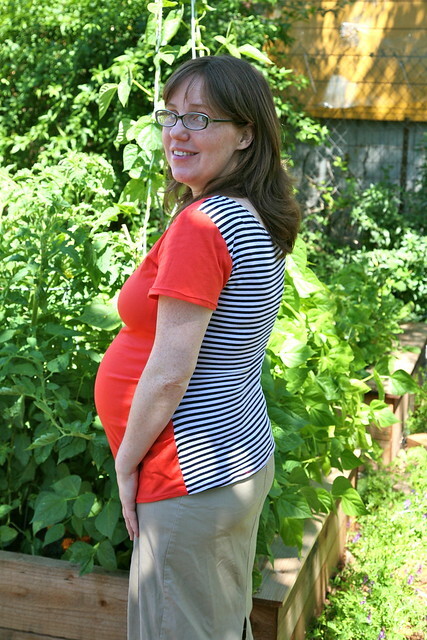 Inder Loves Folk Art: Ruched Maternity Tee, Take Two. I started this project two weeks ago, but then life, in the form of a bad head cold, way too much to do at work, and a BBC Sherlock obsession, intervened. You know how that goes. 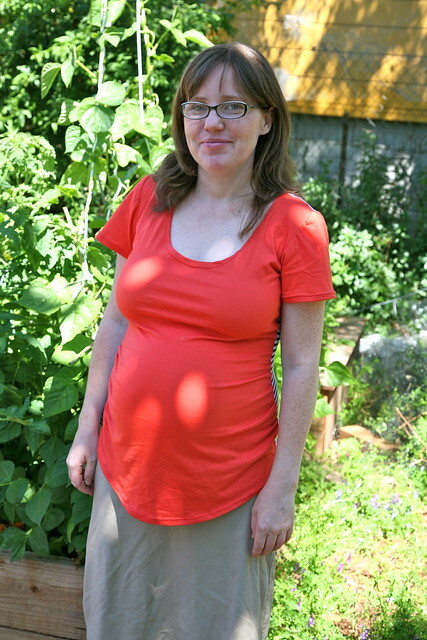 The idea was to use up the fabric left over from this dress and this top to make another Ruched Maternity Tee from Megan Nielsen's pattern line, and I totally ripped off was inspired by this gorgeous floral-backed version of the Ruched Maternity Tee at Cotton and Curls. Result: A coral pink tee. With a contrasting striped back. 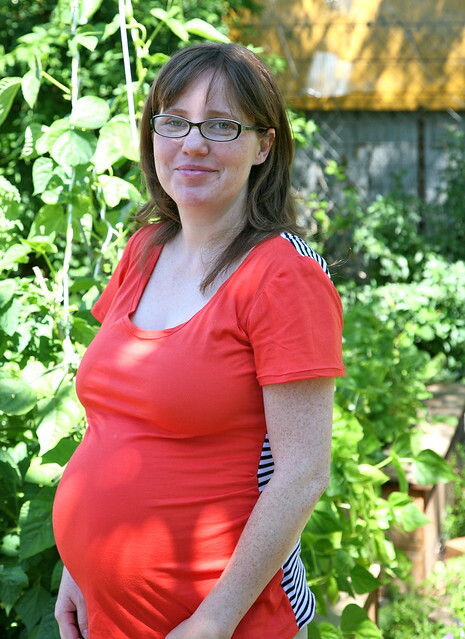 I'm 32 weeks pregnant now, and at my last appointment, my midwife told me I look "ripe." I'm taking this as a compliment? Ha. What I'm noticing is that after a relatively easy pregnancy (at least compared to my pregnancy with Joe, when I suffered from nonstop excruciating back pain), I'm finally slowing down a bit, in sewing and in life. I took Joe to the farmers' market this morning, and for once, his slow, meandering three-year-old walking pace (stopping every few seconds to exclaim "yellow flowers!" or "blue train!" or "look Mommy, a bird!") was just perfect for me. Anyway, "taking time to stop and smell the flowers" has a much nicer ring to it than "waddling," don't you agree? Haha! A pregnant zebra! I'm going to take that as a compliment too. I was going to make some kind of stupid joke about how the raised beds, like me, are exploding with life, but decided to let it go. They are doing great, though. Someone needs to come take some mustard greens off my hands, though! Haha love jane's description of you. This top is awesome. I love the stripey back piece so I think it was a good call on your part. Thanks! I suppose when one is visible from space anyway, one might as well embrace it with some horizontal stripes, eh? This pattern is awesome, fits great, and I love it. Apparently contrasting backs is the new t-shirt trend! I went into GAP this week (which is strange because I hardly EVER go there, but I needed new jeans and I'm not ready to make my own and I like the longer length they do) anyway, they have COPIED your contrasting front/back top!!! Ah!!! Did you find it? I can't see any on their website. I should have taken a photo. May have to go back! No, I didn't see it, although I only took a quick peek. Next time I walk by a Gap, I might have to step in to investigate! You look amazing, JoMo! Lovely glow about you. The coral is flattering on you and you know, I like the striped back too! Very fun and unexpected! Great top! And you look lovely. You must be so excited about the new baby. It's different being pregnant with a toddler in tow, hey! And great that you're listening to yourself and slowing down. Hope the next few weeks go well for you too. Thank you! And yep, pretty excited! Another great project. Coral suits you! I think the striped back is super fun too. WSS all the way. and wow that garden!! Thanks! Yeah, right behind my head, the runner beans are reaching for the sky - they are at like eight or nine feet right now! It's like Jack and the Beanstalk!! Ah, you look fantastic! I bet you are getting excited and I'm glad you haven't had back pain this go around! Thank you! It has been easier in many respects this time around. I'm not going to say there's been NO back pain, but it's all pretty manageable, whereas I was pretty incapacitated with Joe. So that's been huge in terms of my mood and energy levels. So glad that you are slowing down - second pregnancy's are so different from the first in unexpected ways. Okay, so most of you seem to like the striped back!? I'll have to keep wearing it and see if it grows on me. This second pregnancy has been really different! Everyone said it would be, but I didn't really believe it. Weird! I love the striped back too and the pregnant zebra description is hilarious. Pleased to hear this pregnancy has been easier on you. Hope the work eases up and you get to rest more. looks great!! glad to hear you're doing well :) and i like the striped back too. Megan Nielsen's shop is just temporarily closed while she moves. Hopefully she'll be opening up soon and shipping them soon! I think she said it would reopen in June, so hopefully you'll get to sew it up after all!